Simon hanging out in the coreopsis. In winter, the garden can look lonely. 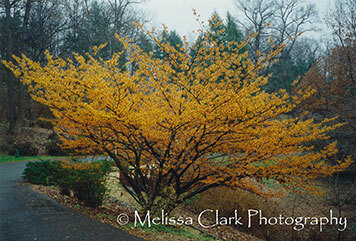 Perennials have been cut to the ground, deciduous shrubs are bare, trees may be leafless. Evergreens take on added importance, as do plants with interesting bark or winter berries. The structure of the garden can be seen more clearly and arresting shapes or patterns can make or break the visual scene before us. Gardeners who have indulged themselves by adding art or ornaments to their landscapes will reap an added bonus at this time of year. 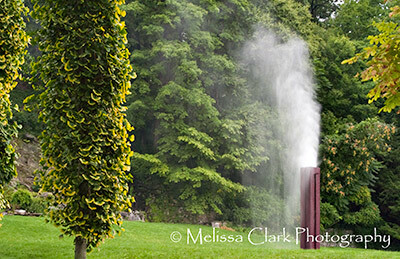 Art in the landscape can be challenging to integrate successfully: a large sculpture may require careful placement and sensitive planting plans to ensure that it shines without competely dominating the scene. 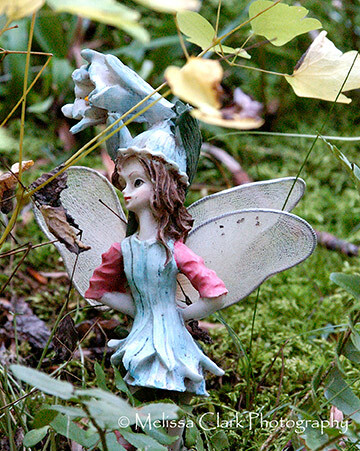 Garden ornaments, however – structures for climbing plants, or smaller pieces of statuary, or arbors, or birdbaths – can find smaller niches more easily and bring a touch of whimsy to the garden in season, while serving as focal points when winter arises. Take Simon (above), for example. While on a garden tour in south central England in June 2001, I came across him in a small garden store in the Cotswolds, towards the end of my trip, and knew immediately that he belonged somewhere in my garden at home. 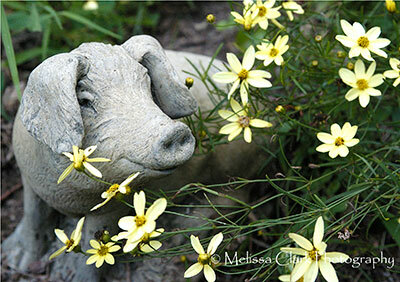 After dragging him back across the Atlantic in one of my suitcases, I found the perfect spot for him among a small drift of coreopsis, whose airy lightness sets off his small but stony bulk perfectly. He can bring a smile to my face when I’m weeding. 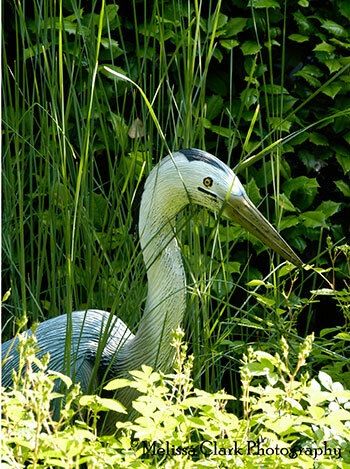 The "hidden heron" at a former client's garden. 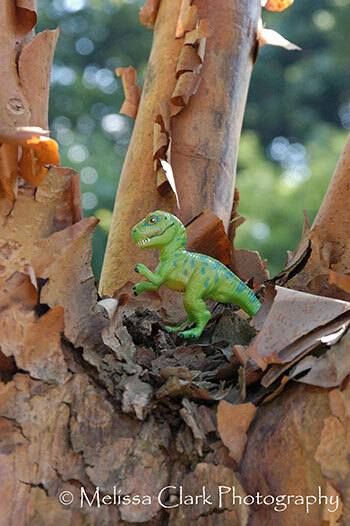 T-Rex at Chanticleer, minus part of his tail, looks perfect in the paperbark maple tree. So between now and spring, as you’re dreaming of next year’s garden, give some thought to adding an ornament or two of your own. You won’t regret it. 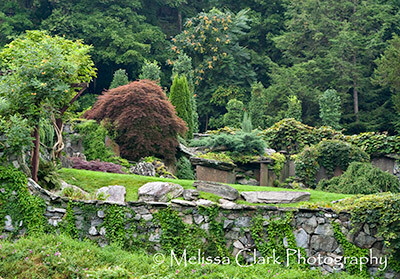 Stonecrop Gardens was another of my destinations in the Great Garden Quest vacation in 2004 in the general area of the Hudson River Valley. 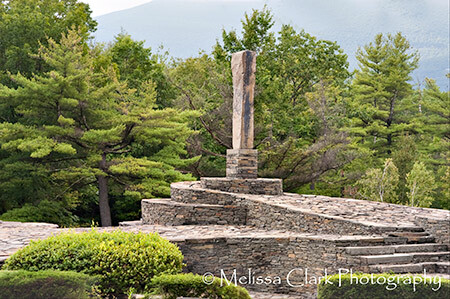 August proved a good time to visit the gardens, which are located at an elevation of 1100 feet in the Hudson Highlands; it was cool and sunny, with crisp air. Stonecrop is open to the public except during late fall and winter, and at the time I visited you had to make an appointment to see it, although that is not the case any more. 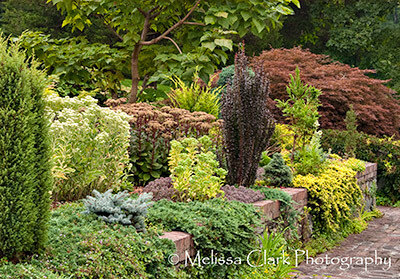 Created by Frank and Ann Cabot, Stonecrop Gardens is the “home garden” (formerly that of the Cabots themselves) of The Garden Conservancy and a fascinating public garden in its own right. Its 63 acres include over 500 species of Alpine plants; a 2000 square foot Conservatory, whose visually arresting appearance is the first sight to greet visitors who find their way there (not an easy task, as Stonecrop is somewhat off the beaten track); an English-style cottage garden with a central vegetable garden parterre; a large woodland garden; a Pond Garden complete with an enormous stand of Gunnera manicata (native to Brazil) which the garden staff takes great care to protect by mulching heavily each year before the onset of winter; and a collection of perennials as diverse as in any other public garden in the state. 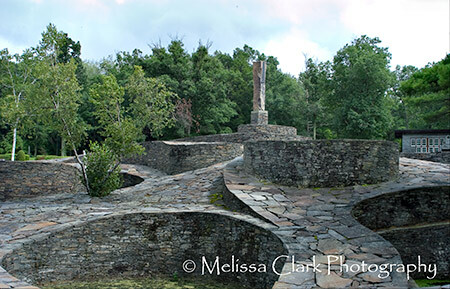 Don’t miss the Lake and Hillside Gardens, with cascading water leading down to a large man-made pool flanked by a grove of dawn redwood trees and weeping Katsura, and the Wisteria Pavilion. 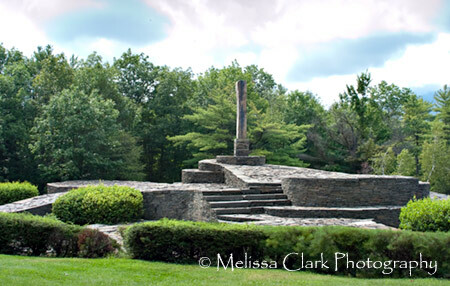 Stonecrop Gardens is located in Cold Spring, NY and is open to the public Monday through Friday and the first and third Saturday of the month, from April to December. Internships are available at Stonecrop each year for individuals interested in a career in horticulture. Years ago, when my family was planning to move to a house with a kitchen the size of a postage stamp, we concluded that cooking in a room too small for two people to turn around in wasn’t a good idea. So we decided to expand the existing kitchen to a space roughly the size of an airplane hangar and hired a young architect who presented us with a bang-up set of plans. There was only one problem: no windows on the west-facing wall of the new addition. I was clueless, but my then-husband was adamant, insisting we add one. Whatever, I thought idly, ruminating about pull-out shelving. Little did I know that by insisting on a window in the west-facing wall of our new kitchen, my ex ended up providing me with one of my favorite views of the gardens that surround our house. Of course, back in 1988, when all this was transpiring, I wasn’t a gardener and could have cared less. But I will be eternally grateful for his persistence. The view in question isn’t spectacular; but it looks out into both a shady area and beyond it, a sunny one as well. A wobbly cedar arch, in past years a perch for robins’ nests, delineates the two areas and some broken flagstone pavers lead your eye from the inner garden to the outer space and disappear in the distance. 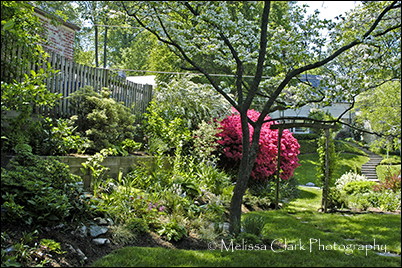 Spring views include a massed bank of crimson-pink azaleas and a dogwood in bloom. In summer, the back-lit grasses and a tuteur in the sunny border. In fall, everything is in a lovely, over-the-top state of decline. And in winter – as I write this – I see the stalks of Liatris, coneflowers, and the stems of a red-twig dogwood shrub (Cornus alba ‘Ivory Halo’) sometimes laced in snow. There are other views from inside my house that I love, the loveliest of which has to be a magnificent old flowering crabapple tree (Malus floribunda) whose branches are so architecturally arresting that I’ve never wanted to screen them from view from the bay window. 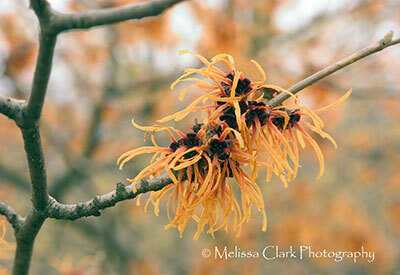 Even when it’s not in bloom, the sight of this tree is a gift I can’t do without. 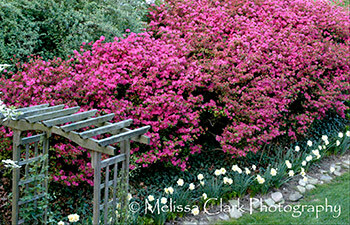 And last but not least cherished is the view from the window next to my bed out into the sunny part of the garden, especially in spring when the azaleas – hardly my favorite shrub except for this time of year – are in bloom. My bedroom window view in spring with daffodils and azaleas in bloom. 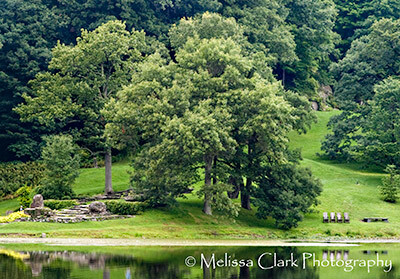 Every gardener should think about views. When I design for clients, I ask them about important views, but you can do the same for your own space. So make sure there are windows where you want them, if you’re planning new spaces. If you’re working with what you already have, think about what you’d like to see on a daily basis, even if it’s only a lovely curved shape of a bed or a tree or shrub that’s striking in two or three (or four) seasons. And you’ll have what I have – a room (or two) with a view.